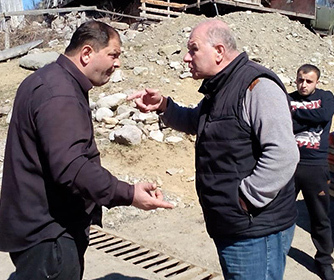 TBILISI, DFWatch–Disagreement over a cemetery led to exchange of insults between Muslims and Christians in a village in southern Georgia on Monday. Samkhretis Karibche, a local online newspaper, reported that the locals verbally insulted each other. The police left before the conflict started. Adigeni is a small village west of Akhaltsikhe with a mixed Christian – Muslim population. Muslims, who are in minority, asked the local municipality to allocate space for a cemetery after a Muslim died and the family didn’t want to bury him on the Christian cemetery. They propose to enlarge the existing cemetery with a separate section for the Muslim community, explaining that they have different funeral traditions. For instance, Christians bring wine to the graves, which Muslims don’t do. The local municipality asked the government’s Religious Agency to decide, which it did on February 25, recommending that a location be allocated in the village for a cemetery for Muslims. Although the religious agency decided to allocate space for a cemetery in Adigeni, the location is up to the local municipality to decide. But a group of Christians warn that they won’t allow the establishment of a Muslim cemetery. “There is only one Christian cemetery and they want to bury there Muslims?” Sknews quotes one of them saying.